This is the documentation for the Atlassian Confluence app WebDAV for Confluence. In the menu on the left side, navigate to “Find new apps” under the “apps” category. 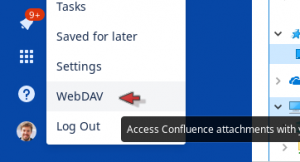 Search for “WebDAV”, wait until the entry “WebDAV for Confluence” is shown and proceed to “Install” the app. Make sure to set a password and follow the instructions for your Operating System on the same page to get access to WebDAV. You can also permanently delete those files within the Recycle Bin. 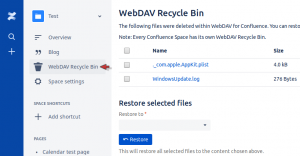 Note that those files count towards your Confluence storage quota (250GB at the moment), so make sure to empty the Recycle Bin if you’ve deleted a large amount of files using WebDAV. If you encounter any issues, feel free to send us an email at support@codefortynine.com. We usually reply within one business day. Thanks for using WebDAV for Confluence!